As more and more raw data observations are recorded about patients in their record, providers are face with an overwhelming amount of complex data points, with little time for making sense of them all. This phenomenon of information overload has been observed in several care settings, from outpatient clinics and primary care, to hospital admissions, and the emergency room. With the advant of health information exchange, reviewing of patient data will only become more complex and time consuming for clinicians. One of the promises of the electronic health record is to support clinicians at the point of care. Clinical information systems, unfortunately, seldom provide effective cognitive support - i.e., they do not present information in an optimal format to clinicians when and where it is needed. HARVEST is an interactive, problem-oriented patient record summarization system. The summarizer differs from previous work in three critical ways: (i) it extracts content from the patient notes, where key clinical information resides; (ii) it aggregates and presents information from multiple care settings, including inpatient, ambulatory, and emergency department encounters; and (iii) it is integrated into the clinical information review system iNYP at New York Presbyterian Hospital, and is available for all patients in our institution, not just a curated dataset or for specific patient cohorts. Rimma Pivovarov, Yael Coppleson, Sharon Lipsky Gorman, David Vawdrey, Noémie Elhadad. Can Patient Record Summarization Support Quality Metric Abstraction? Automated Methods for the Summarization of Electronic Health Records. Jamie Hirsch, Jessica Tanenbaum, Sharon Lipsky Gorman, Connie Liu, Eric Schmitz, Dritan Hashorva, Artem Ervits, David Vawdrey, Marc Sturm, Noémie Elhadad. 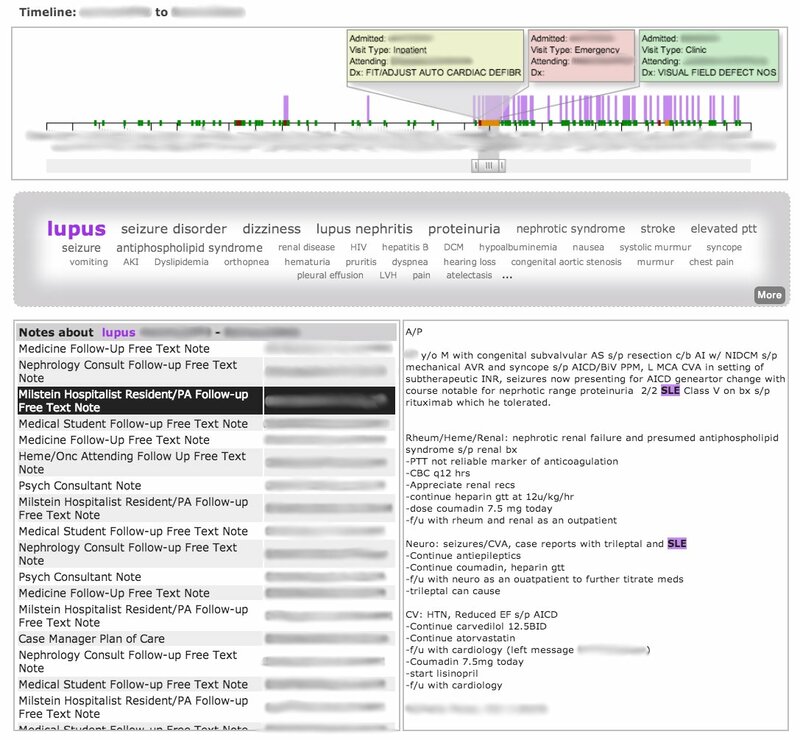 HARVEST, a Longitudinal Patient Record Summarizer. Noémie Elhadad, Sharon Lipsky Gorman, Jamie Hirsch, Connie Liu, David Vawdrey, Marc Sturm. HARVEST, a Holistic Patient Record Summarizer at the Point of Care. Raphael Cohen, Iddo Aviram, Michael Elhadad, and Noémie Elhadad. Redundancy-Aware Latent Dirichlet Allocation for Patient Record Notes. Preethi Raghavan, Eric Fosler-Lussier, Noémie Elhadad, and Albert Lai. Cross-narrative Temporal Ordering of Medical Events. Raphael Cohen, Michael Elhadad, and Noémie Elhadad. Redundancy in Electronic Health Record Corpora: Analysis, Impact on Text Mining Performance, and Mitigation Strategies. Rimma Pivovarov and Noémie Elhadad. A Hybrid Knowledge-Based and Data-Driven Approach to Identifying Semantically Similar Concepts. Daniel Reichert, David Kaufman, Benjamin Bloxham, Herbert Chase, and Noémie Elhadad. Cognitive Analysis of the Summarization of Longitudinal Patient Records. Tielman Van Vleck and Noémie Elhadad. Corpus-based Problem Selection for EHR Note Summarization. Tielman Van Vleck, Adam Wilcox, Peter Stetson, Stephen Johnson, and Noémie Elhadad. Content and Structure of Clinical Problem Lists: A Corpus Analysis. Noémie Elhadad, Kathleen McKeown, David Kaufman, and Desmond Jordan. Work for HARVEST is funded by the National Library of Medicine (R01 LM010027) and the National Science Foundation (#1344668).